Now that I have a little one to care for, I’ve come to realize just how wonderful story time can be. Sharing books with Lauren is one of my favorite pastimes… especially the books that I used to read when I was a kid (those are my favorites!). Of course, with a well-stocked bookshelf comes the need for some nice bookends to hold everything in place. 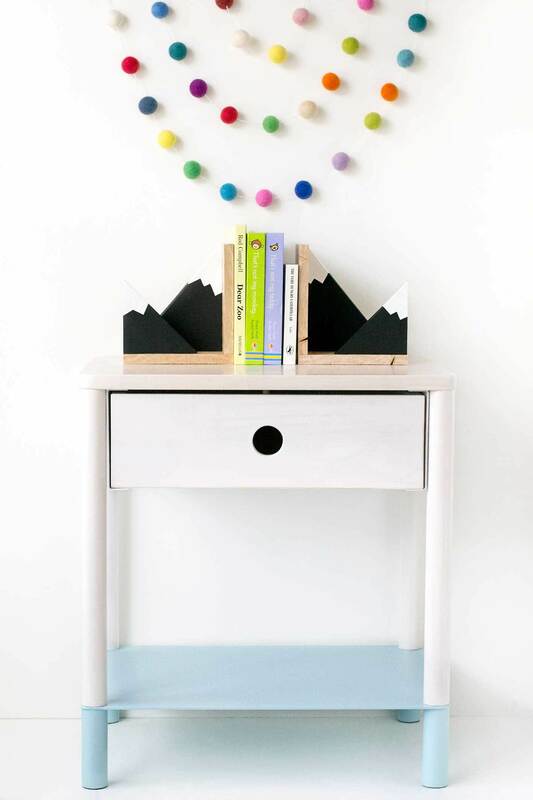 So I decided to whip up these pretties for bubba’s room, and they’re so easy to make, I just had to share these DIY mountain bookends with you too! If you're anything like me, you have a running list of projects you want to try. Things you save repeatedly on Pinterest, ideas you scribble down in the back of your planner, or maybe you just keep a mental list in your brain. Clothesline baskets have been on my want-to-try list for forever, and this week I took the plunge. After conquering the first one, I want to make a million of these clothesline baskets. A million! Additionally, I'm loving the simple stripe in this basket. 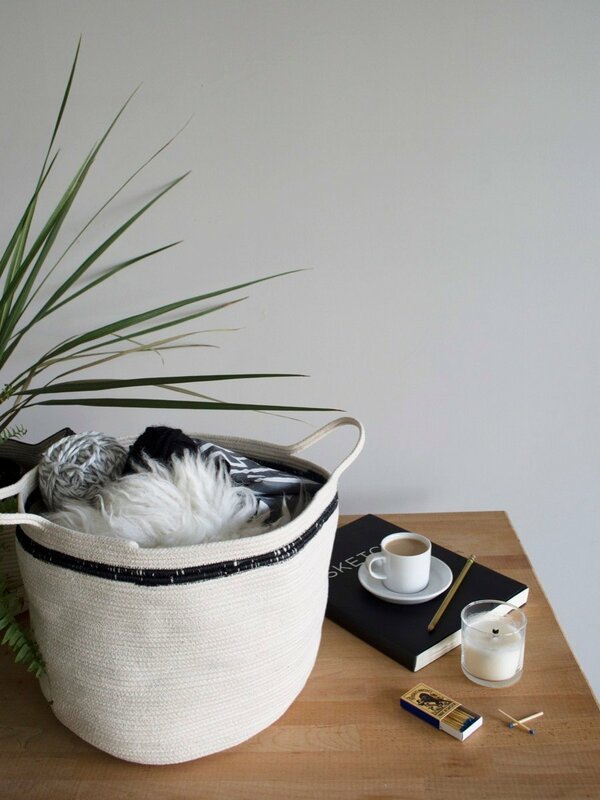 We're exploring all things Scandinavian this month, and this basket fills the bill with equal parts monochrome and texture. Tame That Junk Drawer! Make This Roll Organizer! It's the season of organization and purging, and it's high time to get real with ourselves. Let's talk about the junk drawer. You know the one I'm talking about. The drawer that holds everything and anything: takeout menus, a few rubber bands, hardware from that IKEA chair you bought two years ago, and an orange-handled pair of scissors. Maybe you are one of the blessed few who has managed to avoid the never-ending pit that is the junk drawer. Good for you - gold medal in adulting. If you are an actual human being like the rest of us, or just need a place to put all your tools, why not roll'em? It's hard to believe, but it's already new year... which means that it's time for new calendars! There are tons of gorgeous, free printable calendar downloads available online, so we've rounded up our favorites in a variety of different styles. Click through to check them out and download your favorite. You've decked the halls, hung the stockings with care, wrapped and unwrapped the presents, and it's no wonder if you're all tired out. Hopefully now that Christmas is over you finally have a bit of time to relax. Maybe you already know exactly how you want to spend the week between Christmas and New Year's, but here are 10 ideas for how to unwind in case you've forgotten how. There are a lot of fall activities and flavors that I can take or leave, but one thing I get excited about when the summer heat subsides is tea. On a cool, rainy afternoon, drinking a hot cup of tea is wonderfully cozy. (I think I just realized why tea is so popular in the British Isles.) My growing tea collection was a mess until I figured out the best way to store tea. If you're a fellow tea-lover with an unruly stack of boxes and tins of tea, here are some guidelines and ideas for how to keep your tea organized. I got a text the other day from my mom. She was asking me if I wanted a collection of magazines that she had held onto from my childhood (if you're curious, it was a collection of Cricket magazines from the late 70s). Then I got another text -- my mom had found an old photo that she wanted to share with me. Then four more texts came my way, each containing a picture or memory of something from the past. It was clear that she was doing some deep cleaning. When I asked her what she was up to, she replied, "Have you heard of Swedish Death Cleaning?" Um, excuse me?? Now that people are putting up their Halloween decorations, picking apples, and making holiday plans, it's also time to face some fall chores. Wait, don't go! I know no one likes doing this stuff, but some of it's really important, and you can reward yourself with a trip to the pumpkin patch and an apple cider hot toddy when you're done. (Bribery: Not just for children and pets.) Here's our checklist of fall chores that you responsible adults out there won't want to forget. Has this happened to you? You come home and open your front door, only to immediately get hit with a whiff of something nasty? Ick. Chances are, that unpleasant odor was your kitchen trash. It's inevitable. Trash can odors are going to happen, but there are things you can do to fight the stank. Today I'm sharing a quick trick for eliminating trash can odors, plus some other pointers for keeping the smell at bay. 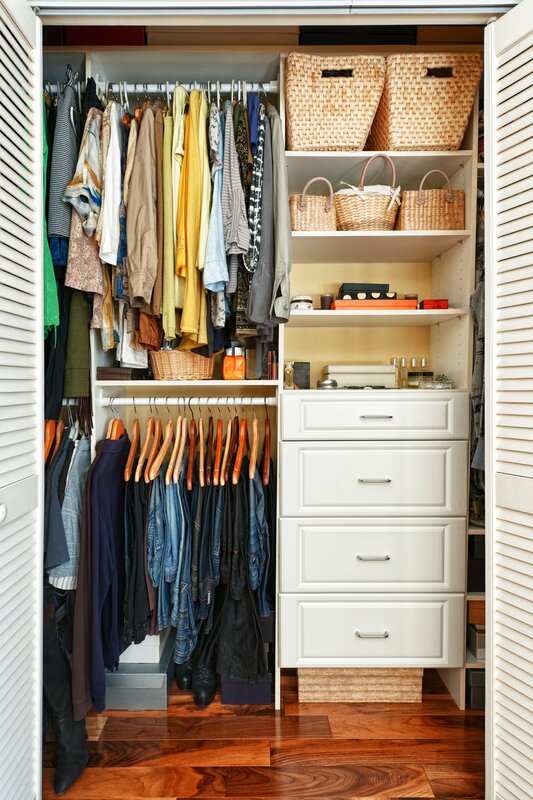 Most beautifully organized closets have one thing in common - built-ins. Whether it be custom shelving or even IKEA installations, a little (or a lot) of construction is needed. But what if you're a renter, and you can't make any permanent changes to your closet? Are you doomed to a single hanger rod and basically a hot mess? Luckily we have some solutions that don't require a power drill. Read on for renter-friendly ideas that will keep your closet nice and tidy. We're lucky enough here at Curbly to have a dedicated office space to work from. Nestled just along the divide between Minneapolis and Saint Paul, our airy studio has hosted many meetings, photo shoots, popups, and has even has doubled as an art gallery for second graders. When Curbly HQ first moved into the building in 2016, the entire space was renovated, from new flooring and lighting to a fresh paint job. Every corner of the studio was considered... well, almost every corner. Our small utility closet has remained untouched until now, and boy oh boy, has it been in need of some TLC. Ah, the linen closet. The junk drawer of the closet world. The gateway to a lesser Narnia. What should be a place for organized towels and blankets can so easily become pure chaos! If you're the type who wads up their sheets and shuts the door, you're not alone! Fortunately, linen closet organization can be achieved with just a little change in routine and some prep work. 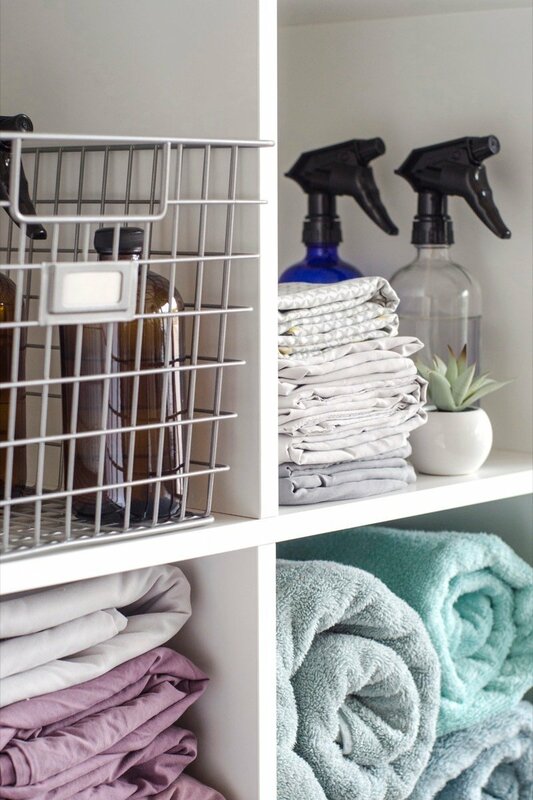 Read on to learn how to make the best use of the space in your home, and tame that linen or bathroom closet once and for all. Our house lacks closet space, especially by the entryway... so I've always wanted a fun coat rack that I could put near the door. But if you've ever tried to buy a coat rack online, you know that it's hard to find a cool one - and the ones that are attractive usually have crazy price tags to match. So of course I decided to make one! Keep reading to check out the instructions for this super easy wood and cement coat rack. True story: I am a little obsessed with organization. I love my home when it's free of clutter, I do believe heaven is The Container Store, and I get a serious rush when I've folded all my t-shirts just right. Maybe I am a bit on the obsessive side, but I think we all can agree that a clean home is simply an easier one to inhabit. 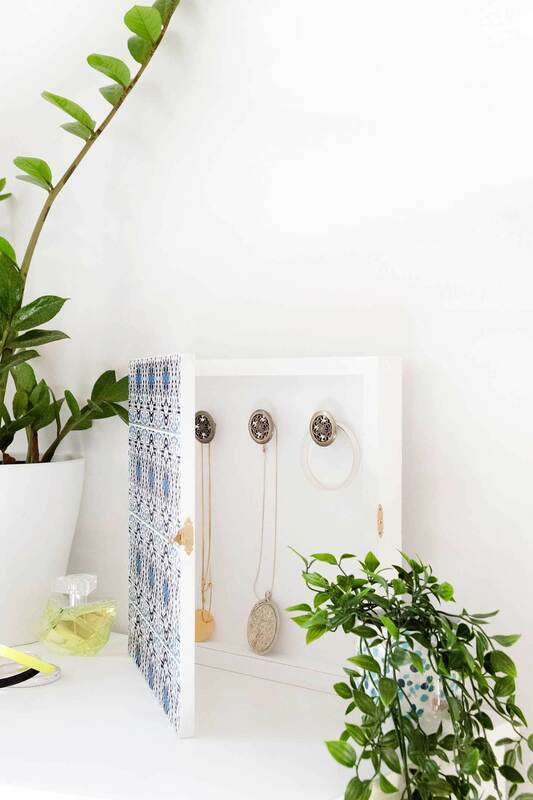 Whether you're feeling overwhelmed by junk, or you're already on a journey towards organizational bliss, this shopping guide is for you. Today I'm sharing a few of my favorite home organization products from Amazon, all of which are affordably priced. This wood desk organizer is modern, minimal, and surprisingly easy to make (even if your woodworking game is totally weak). Read on for step-by-step instructions on making your own, and getting your desktop all tidied up!